Here it is. Another quick review of what we think are big influencers on the beef and cattle markets at the moment. Again it comes with an international flavour including a short note on currency and weather. I have just landed in Beijing where the outlook from the hotel is bleak in comparison to the rain fuelled Spring in Boorowa. Meetings have now started to take place in China. A Food Safety Working Group has been established and were meeting on Thursday and Friday last week. Unfortunately still no end in site and it is widely expected to be November or later before suspensions are lifted. Judge freezes all properties of the Batista family: The decision to freeze Batista's assets is somewhat controversial as the decision is believed to be based upon newspaper reports rather than proper judicial rulings. Interestingly the price of JBS shares has decreased by 25.6% since the end of 2016. Read more. There are many views out there on the movement of the AUD in coming months. 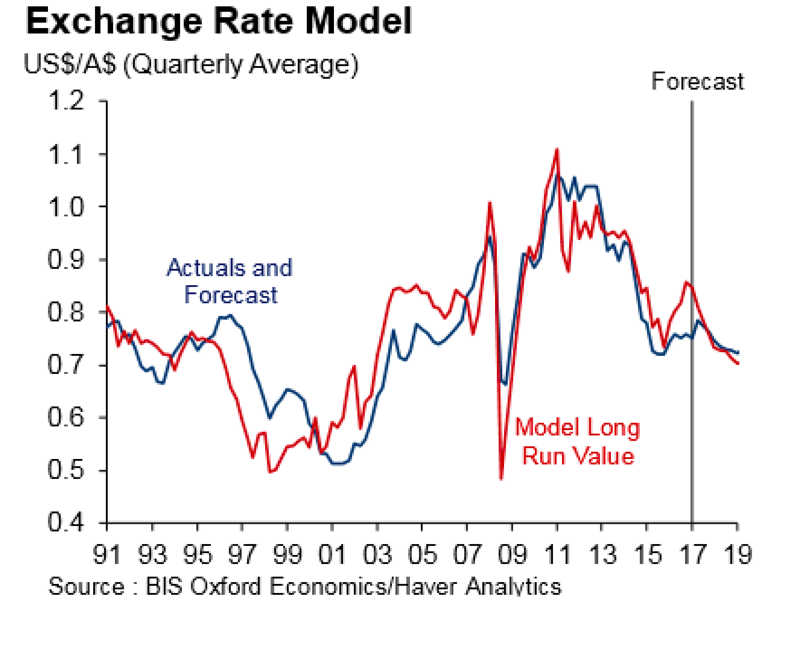 I recently read a note from BIS Oxford Economics which seemed to make sense. They see the AUD depreciating to US$0.75 by June 2018 driven principally by the narrowing of the gap between interest rates in the US and Australia. Commodity prices are expected to be lower and to put downward pressure on the AUD. ANZ has interest rates picked for 83 cents by the middle of 2018 and 74 cents by the year end. CBA believes that based on a weaker USD, the AUD will rise to 85 cents by the year end. NAB has said 73 cents by year end. Westpac at 76 cents by mid year and 70 cents by 2018. Average monthly beef trade flow volumes since the start of 2017, as reported by the Department of Agriculture and Water Resources, shows that consignments to Japan are currently running 15% above the 2016 averages. In contrast, consignments to South Korea over the same time frame are running 14% below the average levels set in 2016. On Friday a safeguard was triggered for beef exported to Korea from Australia from 29.4% tariff to 40%. It came as no surprise and although it will likely have effect on the last 6 weeks of exports for the year it will probably not be drastic. 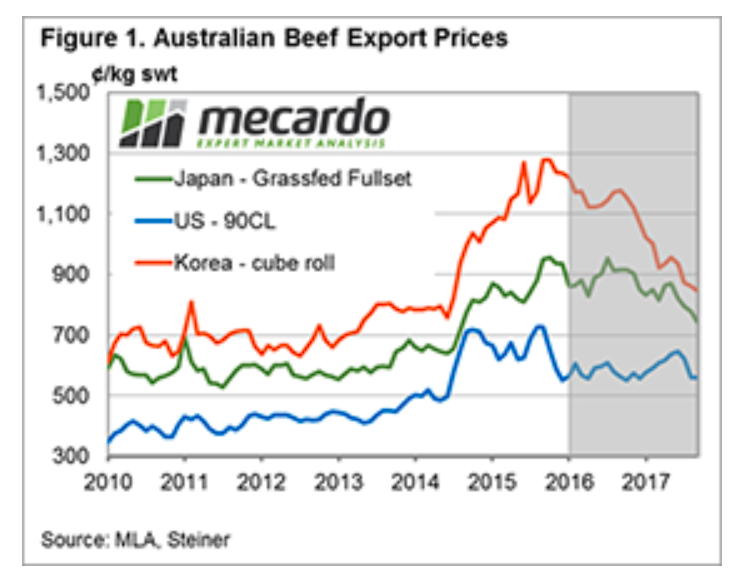 The safeguard was also triggered in 2016 and it shows Australian beef is being well received in Korean market. 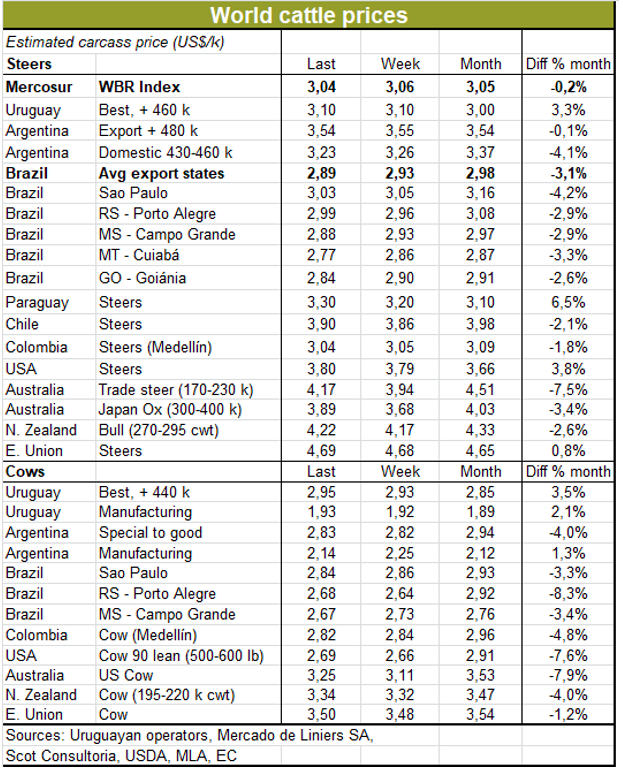 Australian beef exports in September totalled almost 88 tonnes shipped weight (swt) - a 17% increase year-on-year. Increased cattle turn-off, driven by ongoing poor seasonal conditions largely underpinned the rise of shipments compared to last year. Australian cattle slaughter in August totalled just over 677,000 head - 10% higher than the same time last year. 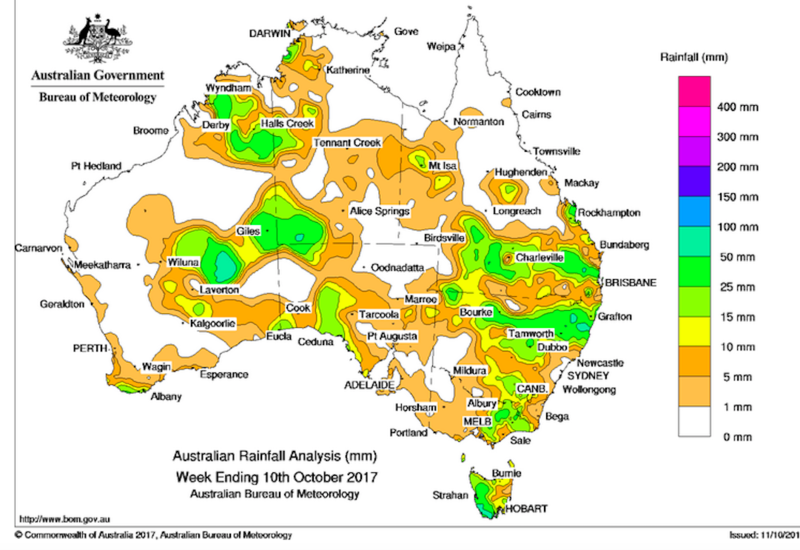 Things starting to look up: Rainfall for the week ending 10th October. 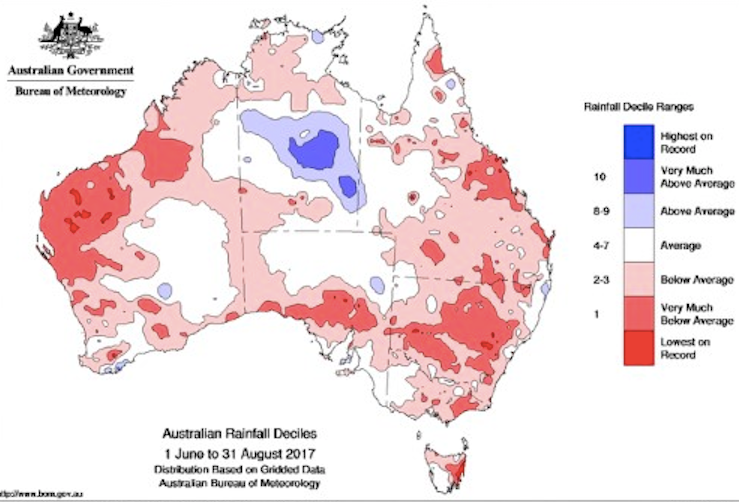 We are now seeing cattle buyers from the north starting to push the job in NSW on back of this and even more recent rain. Angus feeder steer purchases this week are up 10 to 15 cents on last week. 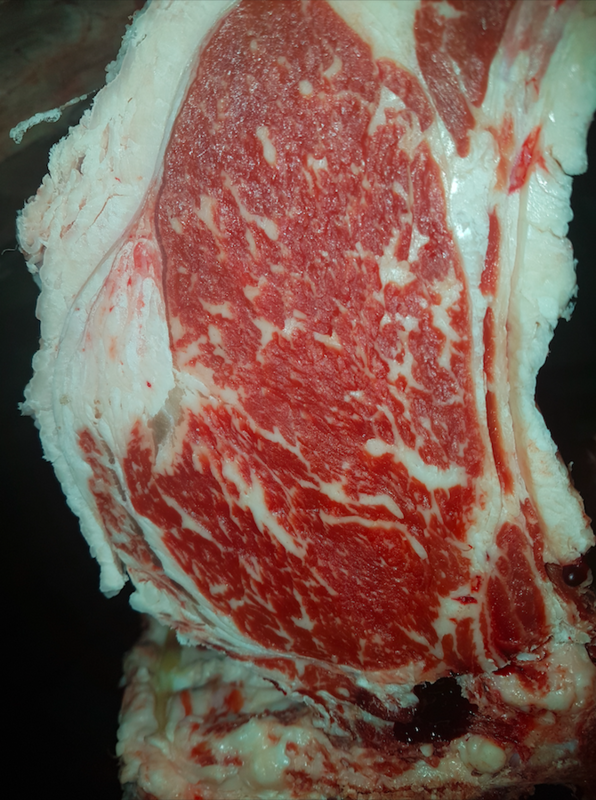 This is some seemingly nondescript Angus 110 day HGP free beef we processed up in Queensland last week. Caught us all by surprise getting this off relatively short fed cattle. It scored a marble score 8. Something that I have never seen off such a short fed animal or an Angus. 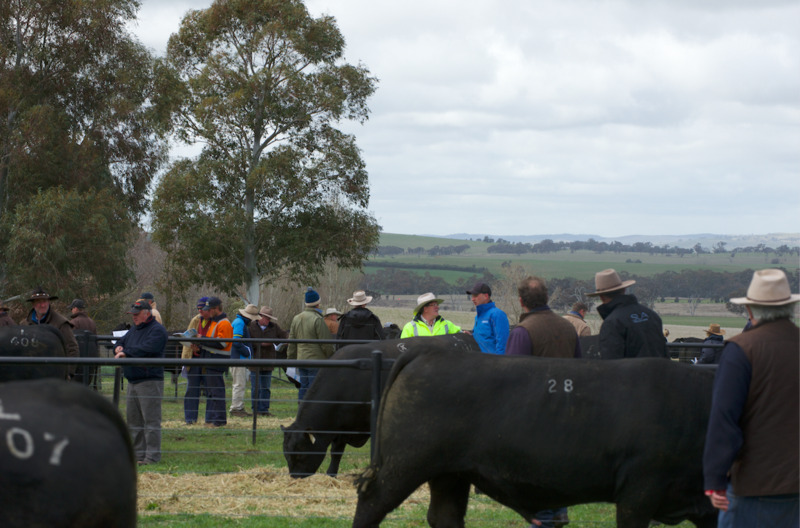 (We also processed some 200 day Angus in the last fortnight and there was nothing close to this). Pathfinder Angus and Chiltern Park Angus purchased the stand out Intensity son L123 for $26,000. Trevor Henwood purchased eight bulls for an average price of $8,600. Nick Harton, Jim Hindmarsh Co, played a big role in the sale and secured 12 bulls for his clients. 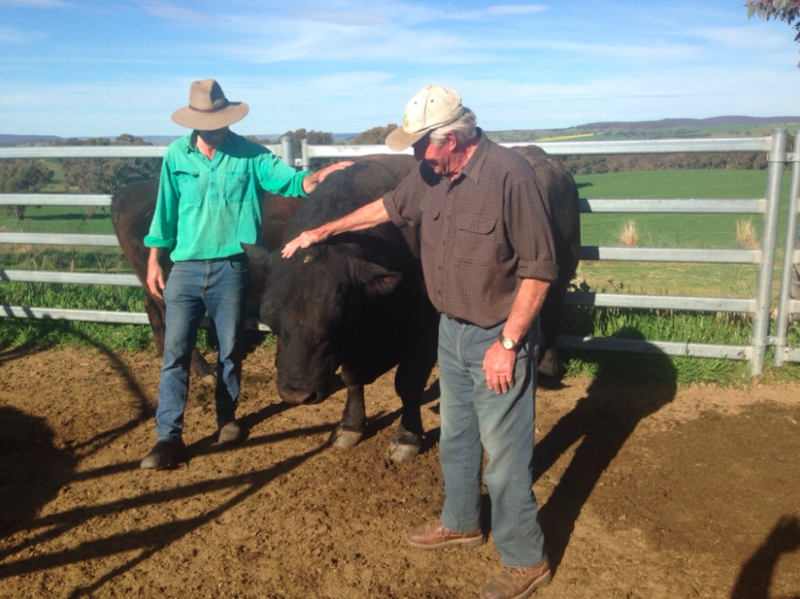 Sam Davidson and father Frank with Kenny's Creek Warwick D149. D149 is a nine year old bull with plenty of longevity and docility (obviously). His dam is a Stern Exact cow with 82 registered progeny. Very pleased to see this bull doing so well. Still working at nine years old!